AnhLan Nguyen from Rosalynn Carmen on Vimeo. AnhLan Nguyen, an IT Project Portfolio Manager at the University of Texas MD Anderson Cancer Center and Chair of the Board of Directors for the Vietnamese Culture and Science Association will be honored with the Asian Heritage Society’s Award in Science and Technology during the Tenth Annual Gala Ceremony Sept. 14, 2013 at the San Diego Marriott Marquis and Marina, 333 W. Harbor Drive, San Diego. AnhLan will join 11 other recipients in categories ranging from entrepreneurship to health and medicine, education, arts and literature and military services along with UCSD Chancellor Pradeep Khosla, this year’s Special Recognition Honoree. The Vietnamese Culture and Science Association promotes excellence in education, leadership and skills development through culture and science. The organization encourages multigenerational and cross cultural collaborations, and fosters civic participation in the mainstream and Vietnamese America. 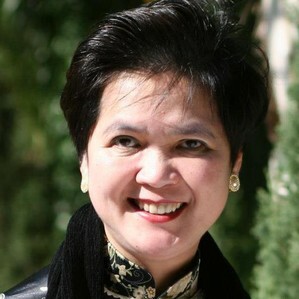 AnhLan established the National Youth Leadership Development Camp in 1998, and two years later, she helped found the Vietnamese Youth Center of Toronto, Canada. This year’s Leadership Camp in Toronto commemorated its 16 years of existence. If you are, or aspire to be a community activist or leader, then Camp Len Duong is for you. 200 students and young professionals participated in this amazing experience. “Many of us have more than enough to live for many years to come as our hearts and minds were opened and lifted” said Luu Duc Cuong from Toronto. AnhLan won the Women’s Leadership Empowerment Award by the Texas Women Empowerment Foundation in 2011 and was named one of the “Top 25 Women of Houston” by Comerica Bank and the Steed Society in 2010 for her leadership and community involvement. In addition, she won the Outstanding Community Leader Award from the Youth Leadership Council of Houston in 2004. On May 17, 2012, AnhLan was appointed along with Ms. Quyen Vuong as members of the Board of Directors of the Viet Nam Education Foundation. They are in Vietnam this month selecting the candidates for the fellowships. In the last ten years, the Asian Heritage Society’s Asian Heritage Awards has become the premiere event of its kind for Southern California’s Asian community. Former Congressman and now San Diego Mayor Bob Filner has called it “the most festive and lavish social event for the Asian Pacific Islander community.” The event has been recognized by the U.S. Congress, the City and County of San Diego and twice cited for its public service by the San Diego Press Club, one of the largest organizations of its kind in the country.